Screening for bowel cancer focuses on men and women between 55 and 75 years old. Once every two years people in this age group are invited for participation. 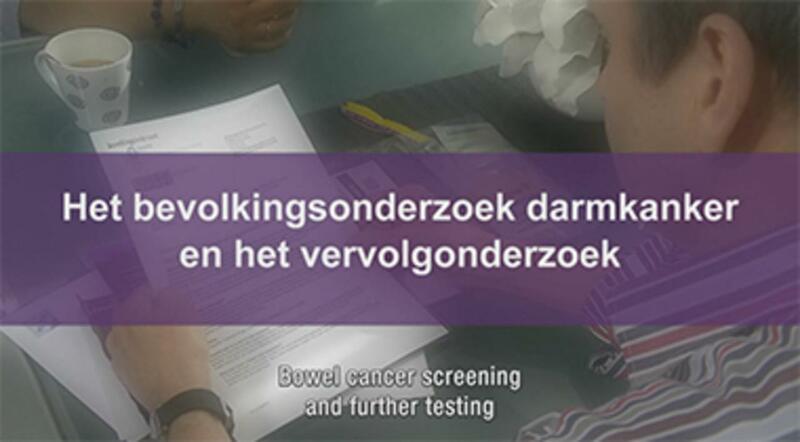 On May 25, 2011, the Dutch Minister of Health, Welfare and Sport (VWS) decided to implement a national population screening programme for bowel cancer. This decision was based on a recommendation given by the Health Council of the Netherlands (GR) and on data from a feasibility study carried out by the Centre for Population Screening (CvB) at the National Institute for Public Health and the Environment (RIVMNational Institute for Public Health and the Environment ). January 2014. This was done in close collaboration with many organizations. The national screening programme for bowel cancer is for men and women in the age group 55 to 75 years. This amounts to a total number of four million people. The national screening programme will be introduced in phases, between 2014 and 2019. The starting date was January 1, 2014. The population screening is done by testing stool samples from the participants; they are sent a home kit (iFOBT) for this purpose. The iFOBT home test can detect any traces of blood in the stool sample. The participant uses the home kit to collect a sample and then sends it to the laboratory for analysis. The results of the test are sent to the participant by letter. If the test result is abnormal, then the person in question will be referred for further diagnosis; this is an internal examination (colonoscopy) of the bowel. This enables doctors to determine whether there is any sign of bowel cancer or a pre-cancerous stage present in the colon. Bowel cancer is one of the most common types of cancer that occurs in the Netherlands. The national screening programme is aimed at cancer in the large bowel. This type of cancer is one of the most frequently occurring in the Netherlands. Each year, approximately 4,800 people die as a result of this condition. In the long term, a national screening programme could help about 2,400 people a year who would otherwise die from bowel cancer. In the pilot study, about six out of ten people responded to the invitation to participate in the screening. Programme coordinator(s) population screening for bowel cancer: Lydia Paauw and Monique van Wieren.